Microfluidic platforms have revolutionized medical diagnostics in recent years. Instead of sending blood or urine samples off to a laboratory for analysis, doctors can test a single drop of a patient’s blood or urine for various diseases at point-of-care without the need for expensive instruments. Before the sample can be tested however, doctors need to insert specific disease-detecting biomolecules into the microfluidic platform. While doing so, it has to be ensured that these biomolecules are well-bound to the inside of the device to protect them from being flushed out by the incoming sample. As this preparatory step can be time-consuming, it would be advantageous if microfluidic platforms could come pre-prepared with specific biomolecules sealed inside. However, this sealing process requires exposure of the device components to high energy or ‘ionized’ gas and whether biomolecules can survive this harsh process is unknown. To answer this question, researchers at the Okinawa Institute of Science and Technology Graduate University (OIST) have created a novel sensor that detects biomolecules more accurately than ever before. This sensor was used to demonstrate that biomolecules can be successfully sealed within microfluidic devices. The results, published in Nanoscale, have profound implications for healthcare diagnostics and open up opportunities for producing pre-packaged microfluidic platform blood or urine testing devices. The microfluidic platform device, in which disease-detecting biomolecules can be bound for ready-to-use test kits, is not much bigger than a thumbtack. Traditionally, metal oxide semiconductor (MOS) sensors are used to detect the binding of biomolecules to a surface by measuring changes in charge. Comprised of a silicon semiconductor layer, a glass insulator layer and a gold metal layer, these sensors are incorporated in an electric circuit with the biomolecule sitting in an electrolyte-filled plastic well on top of the sensor. If you then apply a voltage and measure current, you can work out the charge from the capacitance reading given off. Biomolecules with different charges will give you different capacitance readings, enabling you to quantify the presence of biomolecules. 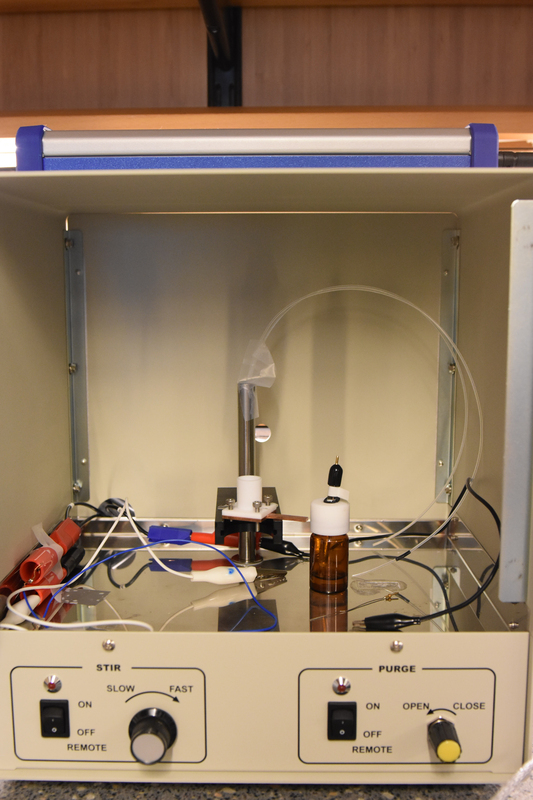 Experimental set up for detecting biomolecules based on changes in charge. The sensor is incorporated in an electric circuit with the biomolecules sitting in an electrolyte-filled plastic well on top of the sensor. The novel sensor created by researchers in OIST’s Micro/Bio/Nanofluidics Unit, measures charge using the same technique as conventional sensors but has the additional function of measuring mass. Instead of having a solid gold metal layer, the so-called nano-metal-insulator semiconductor (nMIS) sensor has a layer of tiny gold metal islands. If you shine light on these nanostructures, the surface electrons start oscillating at a specific frequency. When biomolecules are added to these nanoislands, the frequency of these oscillations change proportional to the mass of the biomolecule. Based on this change, you can use this technique to measure the mass of the biomolecule, and confirm whether it survives exposure to ionized gas during encapsulation within the microfluidic platform. The nMIS sensor created by researchers in OIST’s Micro/Bio/Nanofluidics Unit. 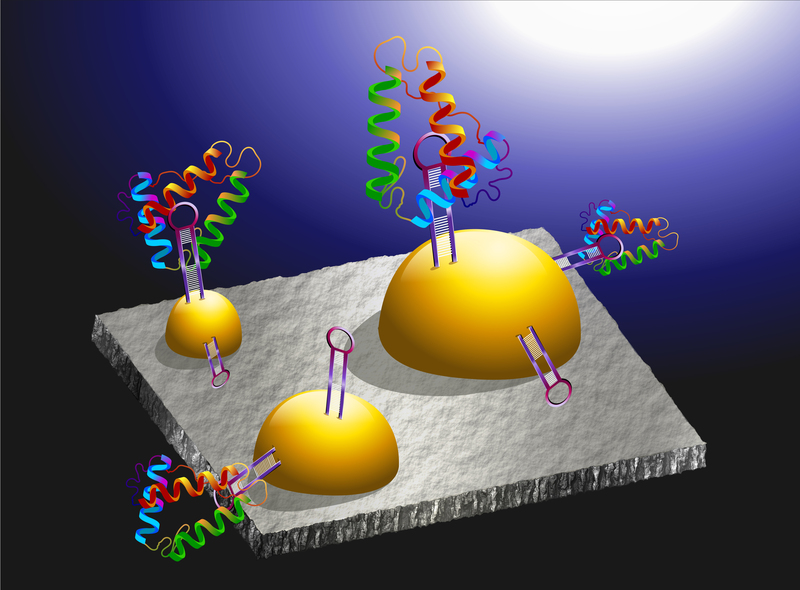 The sensor detects biomolecule charge in a conventional way, but additionally, the gold nano-islands enable the detection of biomolecule mass. “We made a simple sensor that can answer very complex surface chemistry questions,” says Dr. Nikhil Bhalla who worked on the creation of the nMIS sensor. Measuring two fundamental properties of surface chemical reactions on the same device means that researchers can be far more confident that biomolecules have been successfully encapsulated within the microfluidic platform. A measurement of charge or mass alone could be misleading, making it look like biomolecules have bound to a surface when in fact they have not. Having more than one technique in the same device means that you can switch from one mode to the other to see if you have the same result. “Scientists have to validate one reaction with multiple techniques to confirm that an observation is authentic. If you’ve got a sensor that enables the detection of two parameters on a single platform, then it is really beneficial for the sensing community,” says Dr. Bhalla. “By combining these two simple measurement techniques into one compact platform, it opens doors to create portable and reliable sensing technologies in the future”, adds PhD student Shivani Sathish. In a proof-of-concept experiment, by combining information about both the mass and charge of the biomolecule, the scientists were able to show that a common biomolecule survives exposure to ionized gas at a specific energy level. A single reading of charge alone gives a misleading result, but looking at the complementary parameters together allows for more accurate biomolecule detection. This novel nMIS sensor could be used to create microfluidic platforms that test for various diseases. By measuring charge and mass using the nMIS sensor, researchers can ensure that disease-detecting biomolecules are successfully sealed and functional inside the testing device. It might also be possible to combine several biomarkers in the same device to test for different diseases at the same time. By integrating this dual sensing technology with the ready-to-use devices, it offers great promise in the field of healthcare diagnostics owing to its advantages of portability and point-of-care testing.